Why use Evans J1 etched drumhead? I read that the most preferred drumhead by snare drummers is the cheap evans j1 etched drumhead. There are bound to be differences of opinions based on the drummer beating intensity. When I questioned this reason with a hint of sarcasm, I was given another view. Some bands may be asked to perform in a large stage where the microphones may not be able to pick up the drum sounds if the drummer has feather touch. Wow! So many things matter for a music band leader! 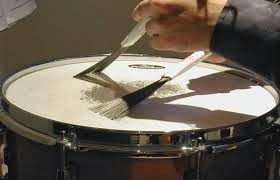 The etched surface of drumhead came into being when more sophisticated drum brushes were introduced because even a mild stroke can be picked by etched drumhead. Rawhides and calfskin drumheads do not respond well to brushes. This new found knowledge was the outcome of an African drummer’s visit to my office to enroll his daughter in my math coaching class.